Get on Stage! 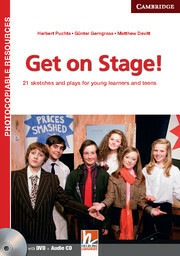 is a photocopiable resource book with 21 original sketches and plays for young learners and teens. The book is divided into four sections: Short humorous sketches, Medium-length sketches, Medium-length plays based on traditional stories and teen dramas. The DVD contains video recordings of three sample plays. 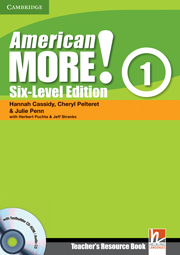 The Audio CD contains audio recordings of a further 11 plays, and photocopiable worksheets to check students' comprehension and practise key vocabulary, lexical chunks and grammar. It also shows co-author Matt Devitt, professional actor and theatre director, rehearsing a play with a group of students.